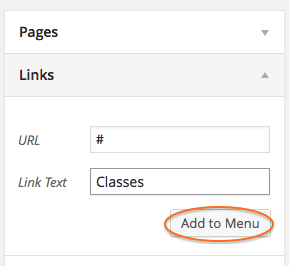 One of WordPress’s features is being able to easily create custom menus with drop-down sub-menus. What if you want the top-level menu item to be a placeholder for the sub-menu items below, but not link to any other content? You can accomplish this using the Links menu type and the # symbol. Login in to your site. Select Links from the menu options on the left. In the Link Text field, type the text you want the menu to display. Drag the sub-menu items underneath this placeholder menu. The Classes menu item does not link to content, but expands the sub-menu items.